A man has died after being sucked into an MRI machine at a hospital in India. Rajesh Maru, 32, was visiting a sick relative and carrying an oxygen cylinder when he was pulled by the magnetic force of the machine after he entered the room on Saturday, Jan. 27. It is thought he died after inhaling liquid oxygen that escaped from the cylinder when it hit the machine at Nair Hospital in Mumbai. The exact cause of death is yet to be established, however, but the dean of the hospital said CCTV footage of the incident had been given to police. “We have arrested a doctor and another junior staff member under section 304 of the Indian penal code for causing death due to negligence,” police spokesman Deepak Deoraj said in a widely-reported statement. Maru’s uncle said Maru had been asked to carry the cylinder by a junior staff member who told him the MRI machine was switched off, according to MailOnline. “The ward boy who was supposed to prevent such incidents told my family members to go inside when the machine was turned on. We are shocked and devastated,” Jitendra Maru said, according to the Mail. Compensation for the victim’s family of 500,000 rupees (around $7,870) has been promised by the state government of Maharashtra. 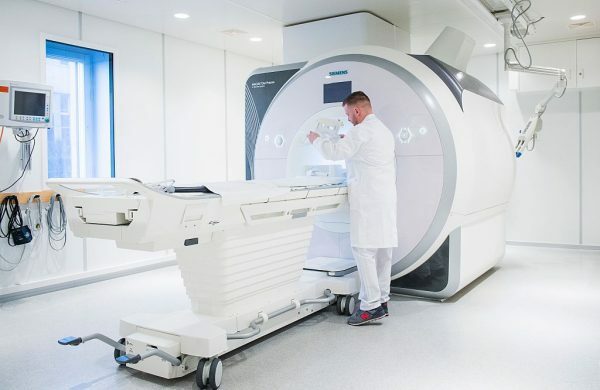 MRI machines work using strong magnetic fields to produce images of the inside of the human body. Because of this, objects containing metal are pulled towards them and cannot be carried into a room.